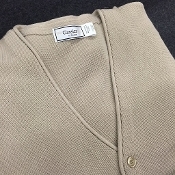 An classic fit links cardigan sweater, for men. Made of %100 Acrylic, made here in the United States, in the links cardigan style. Classics brand made from size small to 2X. No pockets, color tan.